Truth be told, I am pretty awful at sticking to healthy eating plans. I am such a binger, a sweet tooth and a food obsessive and I can’t stop myself. I literally have to keep my cupboards free of chocolate and sweets or I WILL eat them ALL. So instead, I feel that sticking to healthier food options, rather than a plan as such, is the best way to trick my brain into not thinking I’m starving it of all sugars and fatty goodness. Hence less cravings. And so, I wanted to share with you some of my favourite healthy and quick light meal ideas. Whether they’re for lunch or a light dinner, these are the meals I go to when I need something meat free, low calorie and super tasty. And most of all, filling! These are nothing fancy by any means. I don’t call myself a cook and I certainly have restricted skills when it comes to the kitchen. But, I have the meals I like, and thus I thought you may like them too. These are all very thrown together. Don’t rely on set amounts or any of that time consuming stuff. It’s just about having as much as you feel you need on one day. Within reason of course. I mean, if it looks like you’ve made two times what my pictures show you, then maybe you went a little cray with the quinoa. But I’ll try to give as much direction as I can. I just hope you find them as tasty as I do. Okay, lets start of with a goodie. This is Alex’s concoction made with veggie sausages from Linda McCartney. They’re seriously delicious, and even if I still ate pig, I’d still opt for these tasty little guys any day. Lets talk about just one portion for you. One tortilla wrap on your plate. Two sausages under your grill for maybe 20 minutes until they’re looking cooked and browning. In a separate pan, fry off half a red or yellow pepper, sliced into… slices, a quarter of an onion if you like, and throw in maybe 4 cherry tomatoes cut into halves, with a small teaspoon of coconut oil. Don’t forget a touch of salt and pepper. Let them get all sizzly and brown if you like! Then just cut your sausages into bite sized pieces, throw them onto your tortilla with your veggies and slap a dollop of cottage cheese on top. Seriously delicious! Yea I know, we all eat avocado on toast like there’s an imminent avocado shortage. It just tastes so darn great and is a pretty healthy option for brunch. Hence why the health conscious world has gone pretty crazy for it. But with a touch of crab and a few little extras, this has swiftly become the best brunch snack in my repertoire. Cut, peel, de-stone and smash together one avocado in a bowl. Add a grind of salt and pepper, a tiny sprinkle of chilli flakes, a tablespoon of finely chopped fresh coriander and a squeeze of half a lime. Beat together with a fork to mix well. Toast your bread or Warburton’s thins (obsessed), or feel free to use Ryvita, before spreading your avocado over the bread. Flake up half a can of crab meat – fresh is even better, and sprinkle over the top of the avocado. Add a small handful of pine nuts and pumpkin seeds, a grind of black pepper and a little more lime juice, and voila. Delicious breakfast, brunch or lunch. I’m not going to pretend that I came up with scrambled egg on toast, but I did strip it back to the very healthiest and tastiest I could get it. Warburton’s thins once again with scrambled eggs and a few extra flourishes. Simple and the easiest, quickest tasty snack you could make. I find the key to cooking great scrambled egg is to keep your pan warm, not boiling hot. This is a slower process than just heating up your eggs super fast and then having a pan coated in egg to deal with. If you cook it slow and on a medium heat, stirring as you go, you’ll get perfect eggs that don’t stick to your pan. I like to use two or three eggs depending on how hungry I am with a sprinkle of salt and pepper, touch of chilli flakes and a touch of parsley. And that’s it. Toast your bread, add your eggs, throw on some pine nuts, a dollop of cottage cheese and some more parsley. Add almond butter to your toast if you’d like, but I find the eggs are a good enough topping. This was one of those dishes that I threw together one evening when I had random bits left in the fridge. 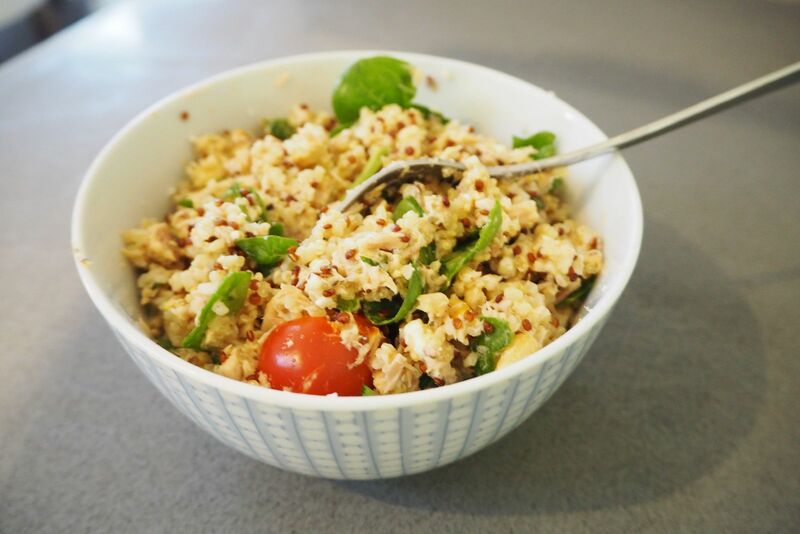 Grains mixed with tuna with a few other bits thrown in, makes for a lovely high protein filled dish and I love every mouthful. Just add as much lemon juice and salt as you like for even more taste, but I find this is one of those easy belly fillers. Use around half a small cup of quinoa with another half cup of mixed grains or freekeh. Add them to a pan and cover with water to around half a cm above the the grains. Add to the hob, bring to boil and then reduce the temperature to allow a slow boil. It will probably need around 25 minutes to cook thoroughly. When it’s ready, I like to add in a full tin of tuna, two spring onions chopped into small pieces, a few cherry tomatoes, small handful of pine nuts, a small handful of spinach leaves if you like, about a tablespoon of chopped coriander, juice of a quarter of a lemon and a sprinkle of salt and pepper. Mix all together and tuck in. When there are eggs in the house, there’s usually always an omelette around the corner. It’s the easiest thing to whip up when hunger strikes. This one just has some more veg thrown in to make it a touch more filling. I tend to take a wide but low sided pan to cook my omelettes rather than a frying pan. I heat the pan to a medium to high heat with a teaspoon of coconut oil to prevent sticking before adding a big handful of spinach. Wilt it down until the spinach is soft and reduced and add a touch of lemon zest and lemon juice from half a lemon. A sprinkle of nutmeg and some salt and pepper over the top will make it pretty perfect. For one person, if you’re making a small omelette, go for three eggs at least I’d say, if not four. If you’re after a larger omelette all to yourself, go for six! Beat together the eggs and add a touch of salt and pepper. Turn your pan down to a medium heat and on top of the spinach, throw in your eggs and mix. At this point, you could add a quarter of a pack of feta cheese, spring onion, tomatoes or any other veg you really like. Make it how you want. But spinach and feta is often my thing. When you’ve got it cooking on the hob, and you feel as though the base has formed and the omelette is cooking through, place the pan under the grill for 5 minutes until you can see the omelette browning. And on the side, stick a large handful of kale into a steamer over a pan and steam for 10 minutes until soft. Again, add some salt for taste. And serve with a side of cottage cheese. This is almost the quinoa bowl from above, but stuffed into a tasty big sweet pepper. This time though, remove the tuna and swap for feta if you’re feeling like you want a slight treat. Just cook your quinoa in a pan like mentioned above, covered by water in a pan for around 25 minutes or until its looking fluffier and soft. Remove any water from the quinoa and mix with a quarter pack of feta cheese, a few tomatoes, a sprinkle parsley and a tablespoon of pine nuts. Cut the two ends off of a sweet pepper and cut it down one side through to the centre, to create an opening. Remove any seeds from the pepper and give it a wash in some water. Now you can fill it all up with the quinoa mixture. When it’s filled how you prefer, place onto a baking tray or grill pan and pop under the grill for 10 minutes, or until browning. The pepper will begin to shrivel and caramelise on the edges which makes it super tasty. And on the side, again a handful of kale and cottage cheese for extra veggies. What’s your favourite quick, easy and healthy dinner or snack. Feel free to leave recipes below or links to something you think I may love! I’d love to see what you all enjoy too! Why a Girls Holiday Could be Just What You Need!